A federal US judge has rejected a new legal attempt to force YouTube to withdraw an anti-Islamic film which made a failed attempt to falsify the character and noble history of the Holy Last Messenger Muhammad (peace be upon him). Actress Cindy Lee Garcia sought a restraining order against the online video giant, claiming that she was duped into appearing in the controversial production,Innocence of Muslims.But, on October 19, US District judge Michael W. Fitzgerald rejected the request, and set another hearing for November 19. Garcia says she thought she signed up for a film called Desert Warrior about life 2,000 years ago, and only realized her lines had been dubbed over when the row erupted last month with anti-US demonstrations. She is one of at least three actresses in the film to come forward claiming they were tricked into taking part in the film, which falsely depicts the Holy Last Messenger Muhammed (peace be upon him) and attributes wicked deeds only the miscreant producers themselves would perform. In an initial lawsuit filed in the Los Angeles Supreme Court last month, Garcia alleged she has suffered severe emotional distress, financial setbacks and the “destruction of her career and reputation,” as a result of the shady practices of the filmmakers. Judge Louis Lavin refused her request for a restraining order to prevent YouTube, a subsidiary of Google, from continuing to show the 14-minute package of clips from the film. Her lawyer therefore took the legal case to the federal court in Santa Clarita, California. The English version of the trailer, which has been withdrawn from YouTube in a number of countries, includes blatantly dubbed over parts of dialogue, and the blessed name of Our Master Muhammad (peace be upon him) was added post production. The 55-year-old behind the film, Mark Basseley Youssef — previously known as Nakoula Basseley Nakoula, and Sam Bacile, among other pseudonyms — was arrested last month. He appeared for a second time in court last week to deny violating the terms of probation for a 2010 banking fraud conviction. 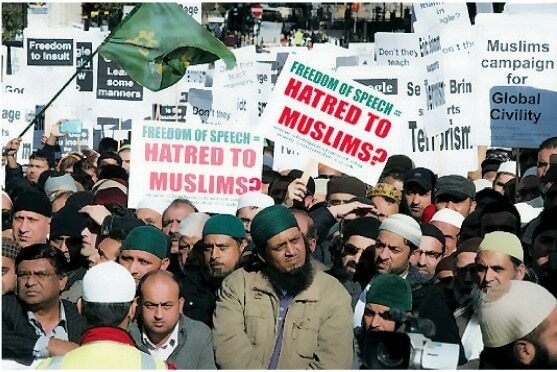 Thousands of Muslims protested across the world in front of Google’s office, for its refusal to remove th e anti-Islam video,‘Innocence of Muslims’.